Note: Includes reported retirements through October 2017 and reported planned retirements for November and December. Nearly all of the utility-scale power plants in the United States that were retired from 2008 through 2017 were fueled by fossil fuels. Of the total retired capacity, coal power plants and natural gas steam turbines accounted for the highest percentages, 47% and 26%, respectively. Most of the planned retirements through 2020 will also be coal plants and natural gas steam turbines, based on information reported to EIA. Various factors influence the decision to retire a power plant. For example, the coal power plants retired since 2008 were relatively old and small, averaging 52 years and 105 megawatts (MW), compared with the fleet of coal plants still operating, at 39 years and 319 MW. Other influential factors include changes in regional electricity use, federal or state policies that affect plant operation, and state policies that require or encourage the use of certain fuels such as renewables. Improving technologies also play a part in plant retirement decisions but may not change the overall use of any one fuel. For example, older natural gas steam turbine technologies may retire, even as newer, more efficient, and operationally flexible technologies such as natural gas-fired combined-cycle and combustion-turbine capacity are being built. The Western, Texas, and Eastern interconnections comprise the power grid of the Lower 48 states. The Western Interconnection covers the area from the Rocky Mountains to the Pacific Coast. The Electricity Reliability Council of Texas covers most of Texas. The Eastern Interconnection covers the area east of the Rocky Mountains and includes some parts of Texas. In this analysis, states are grouped to roughly reflect the three interconnections. The Eastern region contains most of the U.S. electricity generating capacity—736 gigawatts (GW) of the nation’s 1,076 GW, as of October 2017. 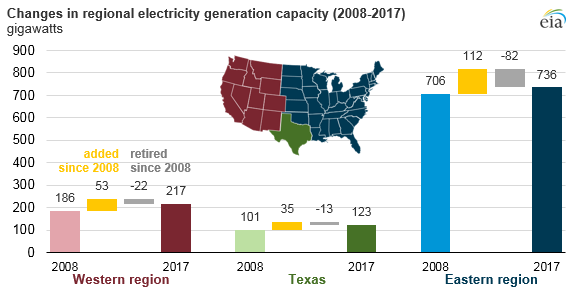 The East had the largest share of capacity retirements in the past 10 years compared with the Western and Texas regions, at 10% of Eastern region capacity. Coal-fired capacity in particular was disproportionally affected in this region, as 19% of the Eastern region’s coal capacity retired in the past decade, compared with 17% of the national coal capacity. Of the three regions in the U.S. power grid, Texas has the least amount of generating capacity, totaling 123 GW as of October 2017. Since 2008, most retirements in Texas were generators that used natural gas steam and petroleum technologies. During that period, a total of 35% of Texas natural gas-fired steam turbine capacity and 66% of petroleum capacity retired. Coal retirements totaling 532 megawatts (MW) accounted for 2% of total installed coal capacity in Texas. However, Texas is expected to have 5,583 MW of coal retirements in 2018, based on planned retirement dates reported to EIA. The Western region of the United States has about 217 GW of operating capacity. San Onofre Nuclear Generating Station Units 2 and 3 provided 2.1 GW (23%) of the Western region’s nuclear capacity before their retirement in 2013. Since 2008, natural gas steam turbine retirements accounted for 46% of the region’s installed natural gas steam capacity.